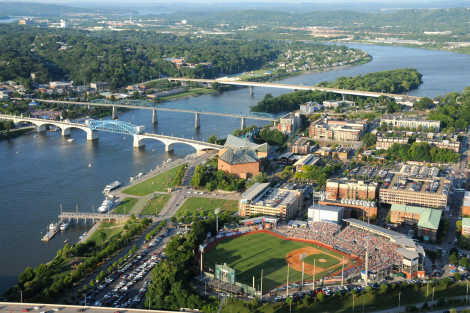 Chattanooga is not only a very popular place to live, but it is also becoming a very popular vacation spot. 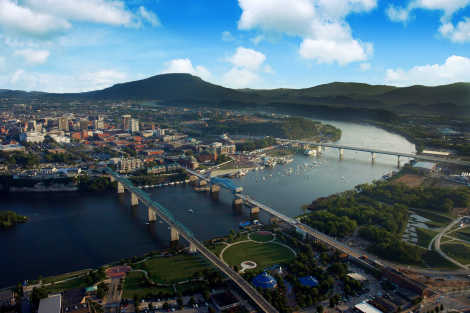 Voted twice as the “Best Town Ever” by Outside magazine and named one of “The 45 Places to Go” in the world by the New York Times, Chattanooga proves to be one of the South’s top travel destinations. Summer in the Scenic City means outdoor festivals, one-of-a-kind attractions, live music and entertainment, outdoor recreation, parks, and so much more. There is so much to do with so many sites to see around Chattanooga that you probably won’t be able to do it all in a weekend – or even in a whole summer! To make it easy, we’ve created a list of some of our favorite things to do during the summer in Chattanooga. 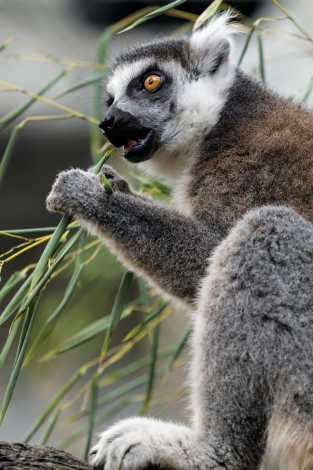 Visit with penguins, lemurs, and thousands of animals at the Tennessee Aquarium, dig up dinosaur bones at the Creative Discovery Museum, take a ride on a camel at the Chattanooga Zoo, or take a drive up Lookout Mountain, just six miles from downtown, and search for the famous gnomes along the garden trails at Rock City. Chattanooga is surrounded by mountains, rivers, and lakes, which offer plenty of world-class rock climbing, bouldering, hiking, mountain biking, and more. For more leisure activities, explore the 13-mile Tennessee Riverpark, kayak or SUP on the Tennessee River along the revitalized riverfront, play Frisbee in Coolidge Park, slide down “cardboard hill” in Renaissance Park, or head up Signal Mountain to see the waterfall at Rainbow Lake. 3. Or escape from the summer heat! If you need to cool down, there are plenty of places to do so. 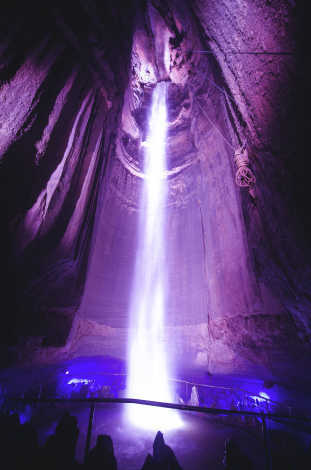 Delve 260 feet below the ground to a nice 60 degrees while you discover the 145-foot waterfall of Ruby Falls, jump into the interactive water fountains in Coolidge Park, play in the water fountains along the Tennessee Aquarium, or try out the new thrilling Winnie 500 racing slides at Lake Winnepesaukah’s SoakYa! water park. Take a cruise down the Tennessee River. 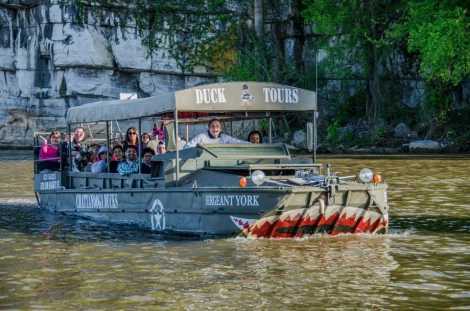 Get out on the Tennessee River for a lunch, dinner or sightseeing cruise aboard the Southern Belle Riverboat, tour the city and river on the Chattanooga Ducks, an authentic WWII amphibious landing craft, or have some fun with friends on the 14-passenger Chattanooga Cycleboats. Go on a one-of-a-kind adventure! Chattanooga offers one-of-a-kind adventures that you can’t get anywhere else. Soar 2,000 feet in the air the Lookout Mountain Hang Gliding Park, go rocking climbing in the heart of Downtown at High Point Climbing center, head to the Ocoee River for whitewater rafting in up to Class IV rapids, or ride the Lookout Mountain Incline Railway, one of nation’s steepest passenger railways at a 72.7 percent grade. Grab a hotdog and enjoy a Chattanooga Lookouts baseball game at AT&T Field or head to Finley Stadium to cheer on the Chattanooga Football Club. Live music and entertainment is available at every turn. You will truly be entertained at The Comedy Catch where some of the biggest stars in comedy have performed including Jerry Seinfeld, Rob Schneider, Tracy Morgan, and more. Check out live music at the weekly free Nightfall Music Series on Fridays, the Riverfront Nights Music Series on Saturdays, or check out who is playing at the Tivoli Theatre and The Signal. These are only a few of the great things you can do in Chattanooga during the summer. We love exploring our great city and would love to show you around! Images credited to the Chattanooga Convention & Visitors Bureau.